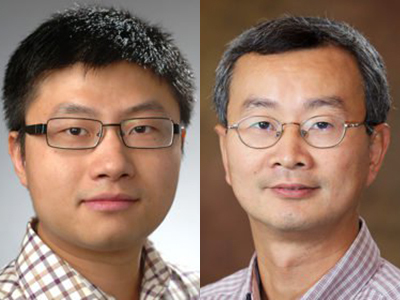 Assistant Professor Yuzhe “Richard” Tang and Professor Wenliang “Kevin” Du in the College of Engineering and Computer Science have been awarded $328,481 by the National Security Agency (NSA) to develop cybersecurity curricula to be taught at the University and beyond. Tang and Du are developing hands-on teaching modules around three topics—classic cryptography, Intel Software Guard Extensions (SGX) and cryptocurrency. Their curricula teach students cryptography in the context of real-world cases and through hands-on experiences. Their classic cryptography modules focus on the fundamentals of using ciphers to scramble and descramble messages to maintain security. To better understand how they work, students require knowledge of “computational hardness”—the level of difficulty in decrypting information. The hands-on modules expose students to abstract theories through direct observation. Modules that explore Intel SGX train students to understand what is happening in the SGX architecture—which prevents third-party cloud providers from being able to monitor customers’ activities in cloud-based programs by encrypting the programs’ memory. The team has developed an SGX emulator to provide students with the ability to work with the platform even if they don’t have access to Intel hardware. Finally, a series of labs will address the increasingly relevant topics of blockchain and cryptocurrency, such as Bitcoin. Traditional currencies are protected by a range of anti-counterfeiting measures. Similar, but more high-tech, measures need to be taken to secure cryptocurrencies. The team is developing labs to help student understand blockchain using actual bitcoin software, as well as labs to teach them to develop new applications such as protecting cryptocurrency mining in the cloud. “Our goal is to create impact. We need to spread this knowledge. Syracuse University’s College of Engineering and Computer is exceptionally strong in cybersecurity education, so we are in a position to provide resources to educators everywhere to enhance cybersecurity practices and prepare qualified professionals,” says Tang. Many of Tang’s and Du’s labs are currently available for free. They will continue to be rolled out over the course of the year-long project. Eventually they will be made available through Du’s SEED Labs platform, which hosts a wide variety of open-source, hands-on cybersecurity exercises. Du also annually hosts cybersecurity educators from around the world to train them to incorporate his labs into their own teaching. It is their hope that this NSA-funded curriculum will prepare countless educators and students as they continue to contribute to the bleeding-edge field of cybersecurity. Could the Jackson/Timberlake Super Bowl Incident Ever Happen Again?